Technicolor sunrises and sunsets. Warm cobblestone streets. Rows of ‘awwww’-inspiring houses reflected in mirror-like canals. Couples holding hands on bikes (guaranteed to grow the hearts of even the Grinchiest of Grinch). Charming, steeped in history, surprises around every corner, Amsterdam is an ideal backdrop for love and romance. And despite being recently named the most expensive European city in which to rent a hotel room, Amsterdam has loads of free and low-cost activities for couples looking for a romantic night out. So, book a sitter, grab your partner, and get out there and soak up all the love generously provided by the famed Dutch capital. A gorgeous street with loads of shops, bars and restaurants, Utrechtsestraat runs the length of Amsterdam center, passing over the canals and through Rembrandtplein. This iconic streets is one of the best paths to take in the city on foot. Grab the drink of your choice, get to strolling and see where you end up. And make sure to snap your pic for Instagram in front of the canal bridges. One of the greenest cities in Europe, Amsterdam has 30 parks, from small, tucked away, to medium, to the Vondelpark, which in addition to being likened to New York City’s ‘Central Park’, holds free concerts on Friday nights in the summer in its open air theater. But no matter which park you end up at, there are no shortage of picnic spots—be it in the grass or alongside a canal—and there are lots of shops and restaurants that cater to picnic makers with prepared foods and cold drinks. The largest terrace in Europe can be found on top of Nemo, the science museum that looks like a giant sinking ship. With its cafe, science experiments and games, Nemo’s terrace is a great way to while a few hours away, relaxing and enjoying the panoramic view of Amsterdam. And as the roof is separate from the museum, entrance is free. Not surprising in a country of swimmers and water lovers, there are a fair number of beaches and lakes in and around Amsterdam that are perfect to reconnect with your loved one and enjoy pink-skied evenings. There are also incredibly cool and ‘gezellig’ spots along the Amstel and the canals, like De Ceuvel, where you can relax on a dock by the water and enjoy drinks and food from the organic cafe. No matter what you choose to do on your evening or day out, pair it with drinks and dinner at one of Amsterdam’s thousands of bars and restaurants. Making a reservation is as easy as booking a Holiday Sitter. Changing the way families travel, Holiday Sitters is a top-notch babysitting service that believes a good cultural match is key to feeling confident your children are in good, trustworthy hands. All Holiday Sitters have years of experience caring for children, are certified and vetted, and speak 22 languages in total. 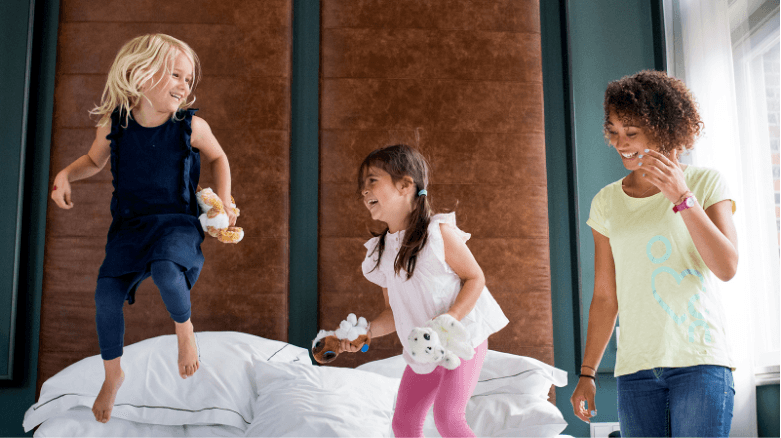 As easy as booking a hotel room, visitors can find the ideal sitter for their family using the company’s robust and easy-to-use website, securely complete the booking and payment, and then chat with the sitter prior to the booking to share any special requests. Finding a good babysitter has never been easier. For more information, please visit holiday-sitters.com.